Starting seeds indoors in the late winter and early spring really increases the time that you can enjoy your vegetable garden in the growing season. Doing this gives you earlier vegetables and flowers and is such a fun project to do with kids. You don’t even need to invest in expensive seed starting containers. There are many items around the house that can be used for the job. 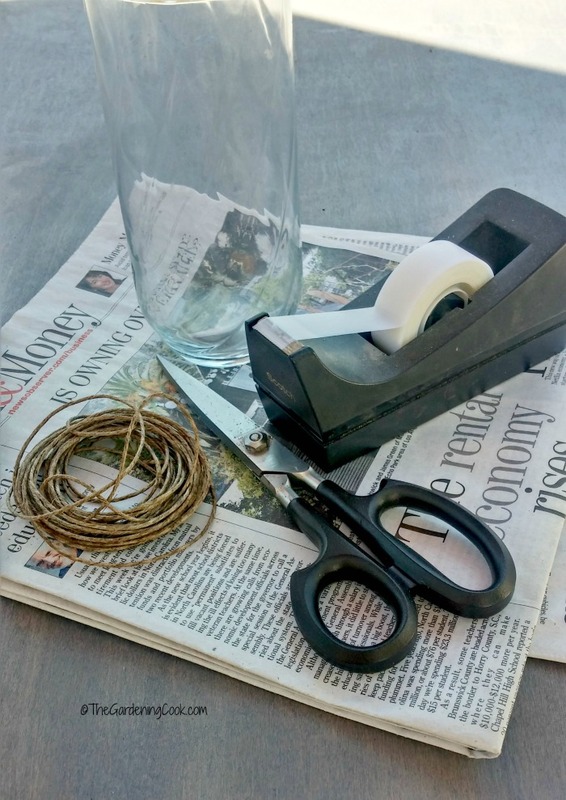 These DIY newspaper seed pots cost almost nothing and make perfect containers for your seeds. 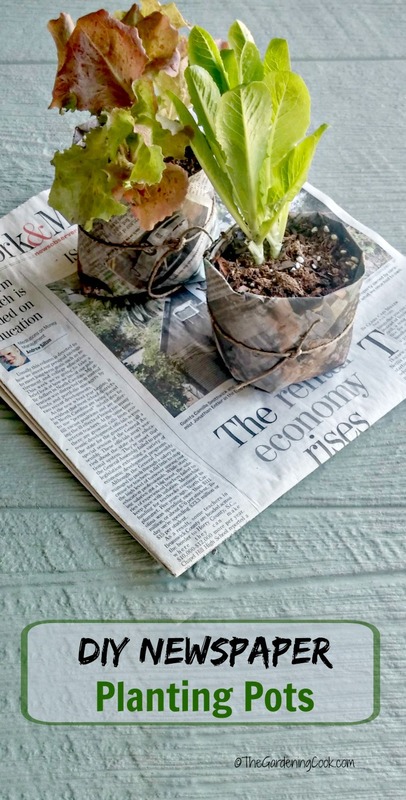 Save money on planting supplies with these DIY Newspaper Seed Pots. 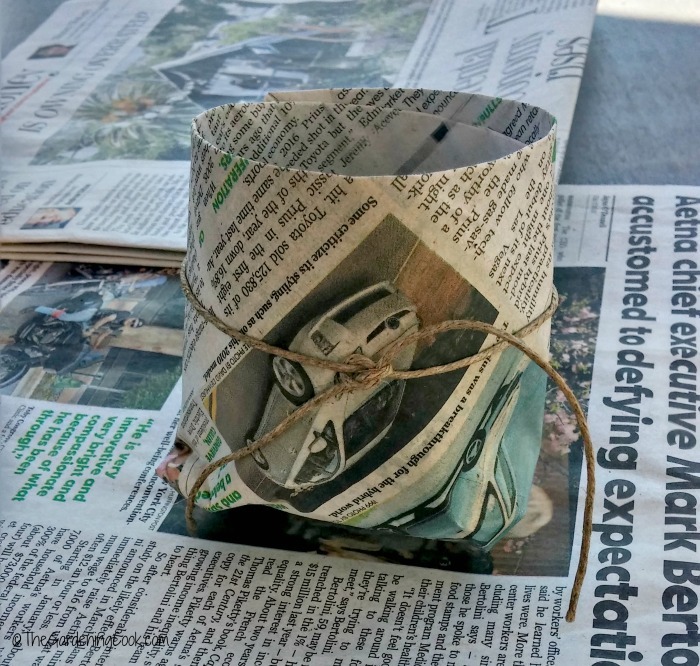 One of the things that I like most about these DIY newspaper seed pots is that you can plant them in the garden container and all. The paper will break downgradually and worms LOVE paper in your soil and soil LOVES worms, so this is a win-win situation all round. The paper in the soil also helps to retain water which means less watering too! 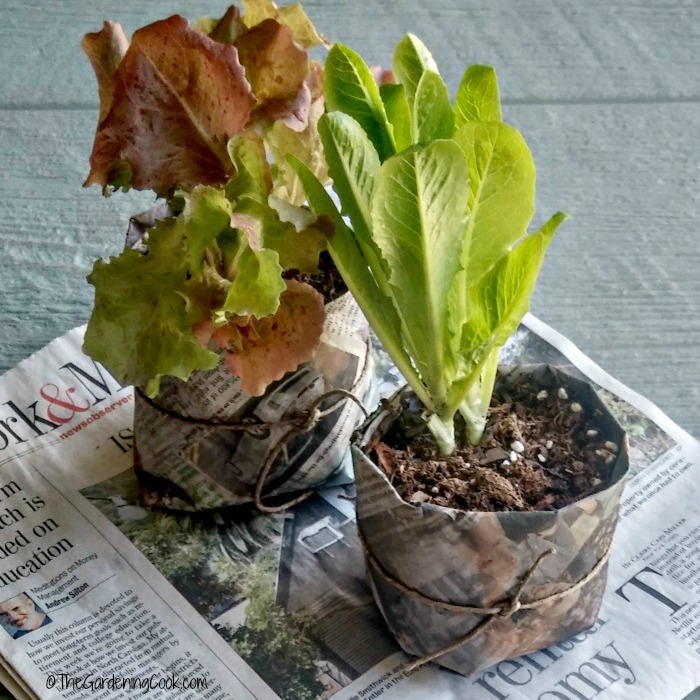 To make these DIY newspaper seed pots you will need a few things that you have around the house. some yarn or juteto tie the pots. drinking glass with straight sides. First cut your newspaper sheets in half and then fold each half into a triangle shape. 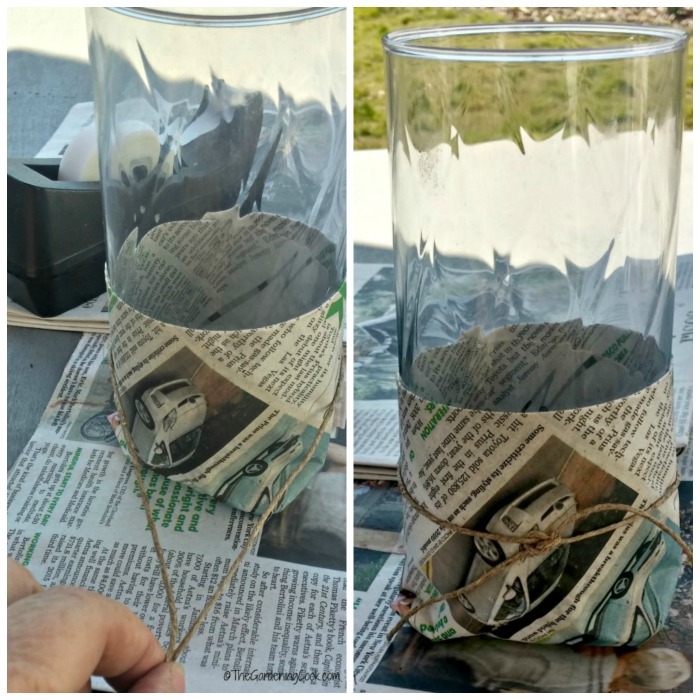 I used 3 double sheets of newpaper and this gives you two newspaper seed pots. Start by laying the glass on its side and wrapping the longest side of the newspaper triangle over the middle of the glass and tape. Then fold in the bottom edges, and fold up and tape again. Now stand the glass on it’s side and measure the length of jute, giving enough to tie. Cut it, and then tie. The jute will hold the plant pot shape together once it starts to get a bit softer from the moisture and looks prettier too! Voila! A pretty plant pot just asking for something to be planted in it! Just slide the pot off the glass and it’s ready to add your seed starting soiland seeds. Depending on the size of glass that you use, these will hold seedlings that are up to a medium size. 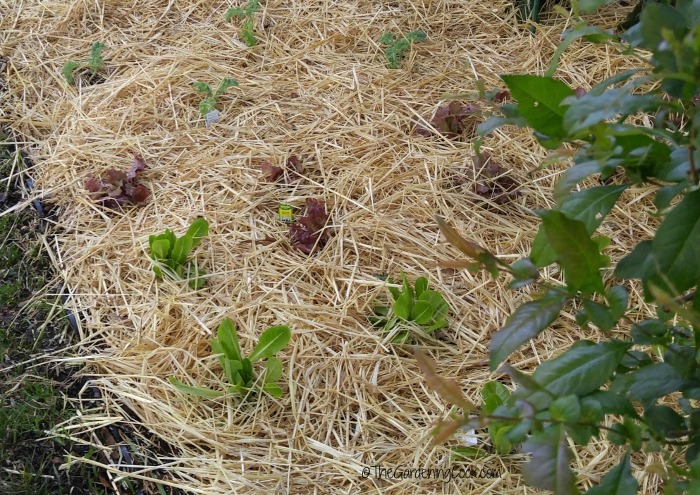 I planted some lettuce seeds in mine. When it is time to plant these in the garden, just snip the jute and cut away the bottom of the pot so that the roots can grow through easily. Now if I can just keep Peter Rabbit away from my lettuce, I will be all set! For more great DIY gardening ideas, be sure to visit my gardening projects board at Pinterest. Thank you for the info. Now l can plant more herbs without the cost of planting pots. Awesome!